I already gave my recommendation for the top gift book of 2012 for the serious home baker or pro-chef, Francisco Migoya’s, Elements of Dessert (reviewed last week). 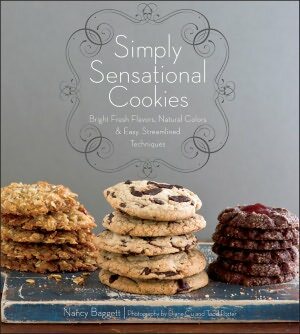 Today, I am recommending Nancy Baggett’s Simply Sensational Cookies–the perfect book for the casual home baker who wants to go beyond basic cookie recipes. It shares some of the characteristics that I like about Elements of Dessert in that it’s really part coffee table book and part cookbook. The photos and quality of the pages are also a step above the average cookbook. 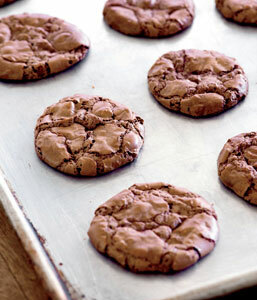 There are over 200 cookie recipes, including macarons, flour-less chocolate cookies and no-bake treats. Lastly, Nancy Baggett equals credibility when it comes to cookies and cookbooks in general so you know the recipes will be solid. Here’s a second choice (reviewed earlier this year) for the advanced baker on your holiday list. Need a gift for a "serious" baker or pastry aficionado? Look nor further. Over the last few months we’ve received some great, pastry-centric books here at DessertBuzz worldwide headquarters. 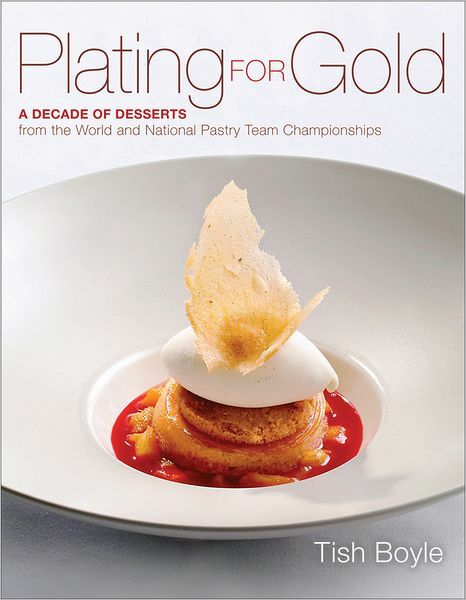 I thought I’d start with my favorite of the bunch–Plating For Gold: A Decade of Desserts from the World and National Pastry Team Championships by Tish Boyle, published by Wiley. On first glance, you might think a book like this would only find an audience with professional pastry chefs or serious amateurs who aspire to some day attend pastry school. That would be an incorrect assumption because this book, with its beautiful photographs shot on white backgrounds, can stand on its own as a coffee table book and also has many features geared towards the novice (more on that later). I’ll admit, many of the winning desserts featured in the book, particularly those with sculptural elements do look quite daunting. But some, like “Georgia” from the 2007 National Pastry Team Championship, seem like they would be just challenging enough to make you feel like you accomplished something without being so difficult that you end up cursing and swearing–not that I have ever experienced that kind of defeat from trying to follow a (recent macaron) recipe. The book contains basic information that definitely reduces the intimidation factor, including a glossary, ingredient guides, explanations of the different types of plated desserts and tools and techniques. 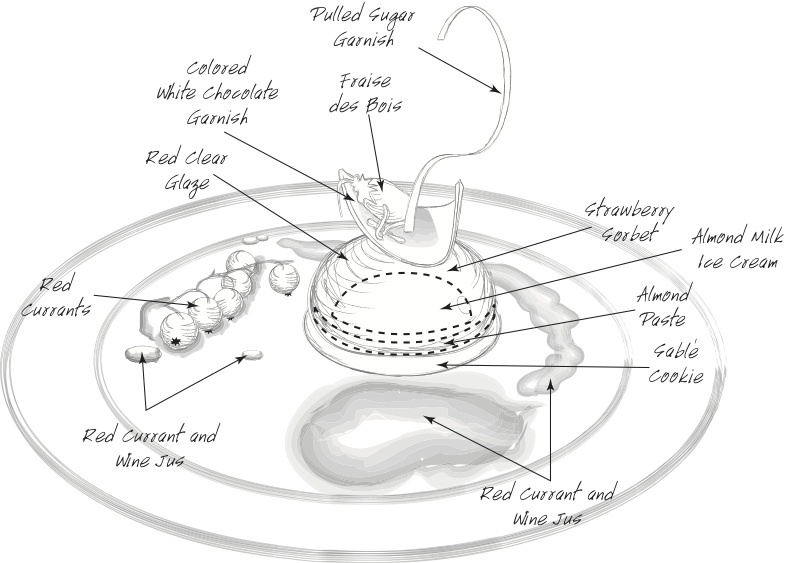 Drawings for the layout of "Strawberry"
In addition to the color photos and recipes there’s also a nice “artist’s sketch” style pencil drawing for each dessert with notes about the layout that help you keep track of where to place all the elements. 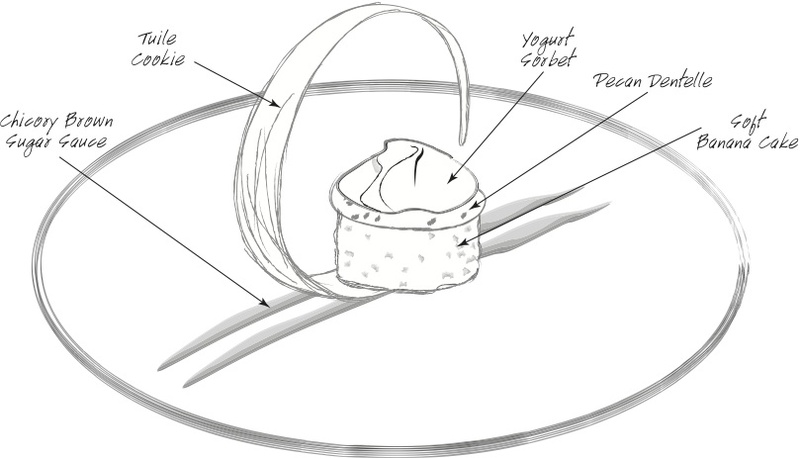 The "back of the napkin" plan for "Creole"
The book contains 50 different plated dessert recipes–many created by some of the most influential pastry chefs in the US. If you’re looking to impress the hell out of some dinner guests with a stunning dessert or you occasionally want to challenge yourself with an advanced creation of your own making–this book will be an asset. Plating For Gold: A Decade of Desserts from the World and National Pastry Team Championships by Tish Boyle is expected in June. Mark your calendars for those summer birthdays gifts. Follow DessertBuzz on Twitter. Good day I am so happy I found your webpage, I really found you by error, while I was researching on Bing for something else, Anyways I am here now and would just like to say kudos for a fantastic post and a all round thrilling blog (I also love the theme/design), I don韙 have time to read it all at the moment but I have bookmarked it and also added your RSS feeds, so when I have time I will be back to read a lot more, Please do keep up the superb work. I absolutely love your blog and find most of your post’s to be exactly I’m looking for. can you offer guest writers to write content to suit your needs? I wouldn’t mind creating a post or elaborating on many of the subjects you write concerning here. Again, awesome site! Yes! Finally someone writes about company website. Thanks for sharing your thoughts about hop over to this site. I think what you wrote was actually very logical. However, consider this, suppose you were to create a awesome headline? dailly and obtain pleasant information from here everyday. blog and I’m inspired! Extremely useful info specially the closing part 🙂 I handle such information much.